Hi! My name is Sara Colohan and I'm a journalist/stylist visiting Buenos Aires to shoot spring summer for some Irish publications including Style magazine and IF magazine. It takes quite a bit of organising - and has taken days to arrange accommodation, models and photographers from my freezing office in Dublin!!! Palermo Soho is my first port of call. Called Soho because it resembles Soho in New York, it's uber cool in places if not a little pretentious. I decided to go basic for my first two nigths and see what exactly you can get for 30 usd per night. But two nights was my limit and I have moved to the rather chic moderately price Costa Rica hotel. 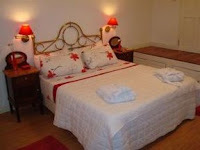 (70 usd for lovely private room, double bed, egyptian cotton sheets hmmm) Five minutes walk from the centre of Palermo Soho. I ll get better images soon.. but their site is great so have a look. It's gorgeous, fashionably mismatched furniture and family run - it epitomised 'boutique hotel' for me. lovely faux renaissance style rooms, free standing baths, antique chandeliers all for the unbeatable price of 100 USD and up. Top it off with the fact that its run by a lovely fella from Bangor and his Argentinean wife, it just felt right to stay there and support them in their brave endeavour. If like me, you love listening to stories of young couples selling up, moving to a foreign land and investing everything into a new business (in their case a run down period building shaped lovingly into a chic boutique Hotel) then stay here and learn how to do it first hand. They’ll also set you up with some great tango lessons! Only downfall is it's right in the centre of Downtown and that means lots of traffic. Our hair andmake up boys! Me on a break! One of the shots from our rooftop shoot. Our next shoot is planned for Monday 1st April. In the mean time I found a local b and b that felt like home! Buenos Aires http://www.gorriti4290.com.ar/ Hernan and his wife run the place, but they also live there - and before you think thats not the best arrangement i have to tell you it was amazing to stay there with them in a genuine Argentinian home where you can come and go, use the kitchen, buy your groceries in the supermarket and just live like a local. I have stayed in many a swish hotel in my day but i truely loved my time here and would recommend it to any anyone. They are also responsible for my extra few pounds that Ive put on - what a great breakfast! Home made cakes, fresh coffee and an array of pastries. All for 45 dollars a night. Unbeatable. GET CONNECTED:Almost everywhere has wi fi with good connections. Internet cafes are plentiful and cheap (less than 1 euro per hr). A local sim for your phone is about 20 pesos so it might be an idea to buy two so you can save a fortune on texting each other! GET SHOPPING A few worthy mentions are Felix (Gurruchaga 1670, Palermo Soho) and Bolivia (Gurruchaga 1581) for men and Divia (Armenia 1498 Palermo Soho) for woman’s shoes.IRISH ROOTS:Don’t be surprised when you meet people called Lynch, Ganly and Kenny speaking English with Irish accents. I met a few in the Irish Embassy on St Patrick’s Day and discovered their accents came from learning English from their parents who were both Irish. It’s very cool to be Irish in Buenos Aires!